This month, I started Sharon’s Encrusted Crazy Quilt class on Joggles and decided to use June’s TIFC colors for my block. The rich, dark, saturated shades are my favorites, and I thoroughly enjoyed selecting them for this block with a few lights added for some contrast. The upper left corner is a black cotton fabric with gold metallic speckles on it, and the long piece under it has some black netting with gold stitching attached to a variegated cream fabric. The gold piece is a tone on tone tapestry with a piece of dark brown lace angled over the edge. Unfortunately , the tapestry threadwork doesn’t show up well in this photo. All the rest of the fabric is quilting type cottons. I’m really looking forward to starting Lesson 2 this weekend, and finding out what the TIFC will be for July. 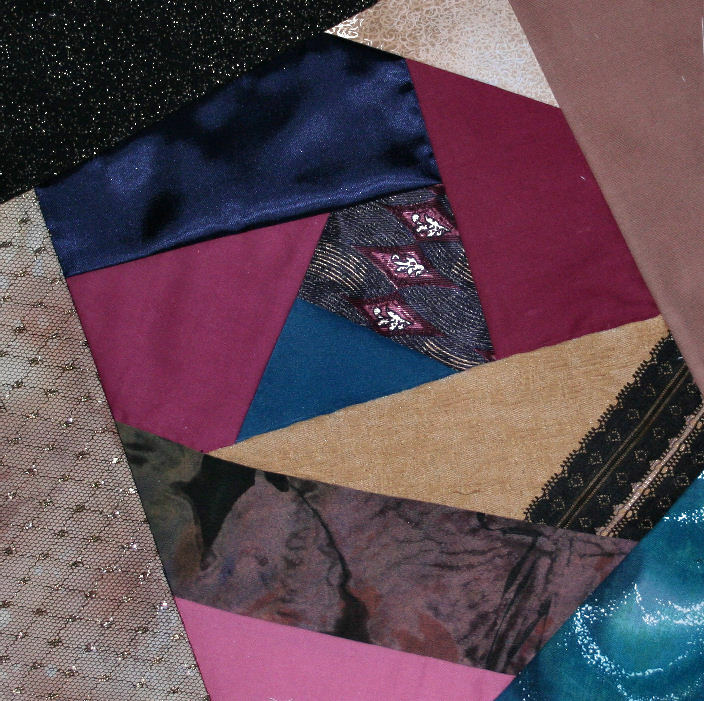 Instead of preparing for a 3 day workshop that starts tomorrow, I continued working on a crazy quilt block for http://www.makingmemories.org/ Don’t ask me why, but I thought I could piece this block in a day. Um, it’s a tucked fan design from one of Jennie Rayment’s books, and first I made a muslin prototype, then the one out of fancy bridal fabric. Working with fancy bridal fabric is a lot different from sewing with muslin. A case of the slip, slide and away sewing syndrome attacked quickly. Sewing kudos to all you bridal dress makers. This block isn’t totally pieced, but I like how it’s shaping up. The shadow underneath the lace motifs at the top of the fan is the netting that holds them all together. That will be carefully trimmed and sewn in place. 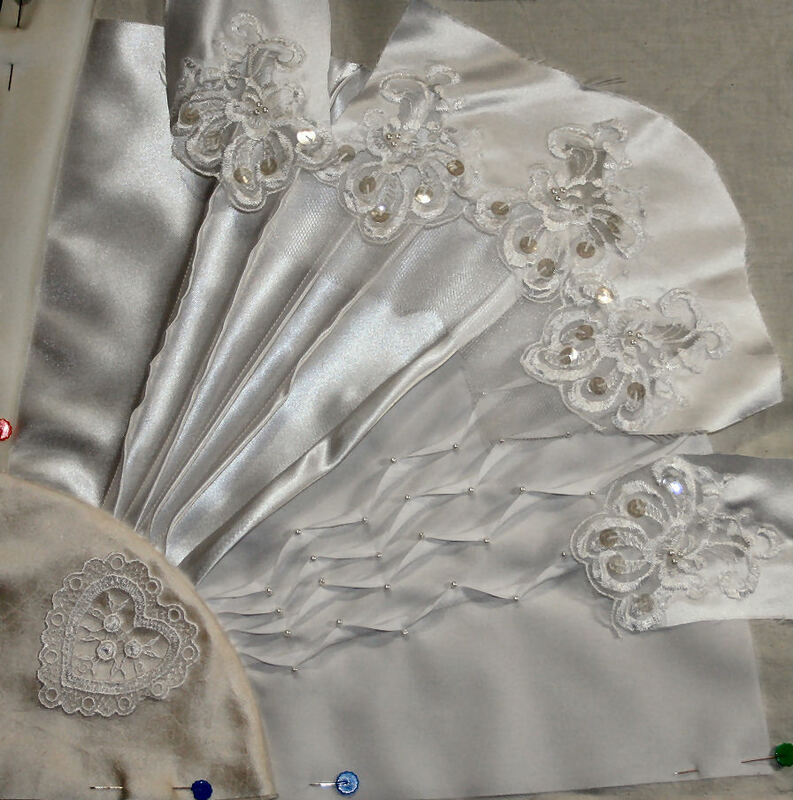 The pearl beads are sewn on one half of the fan – with 2 strands of silk thread. I read in some of my beading books that it’s best to string and sew pearl beads with silk thread, so that’s why I used it instead of Nymo. The heart at the base isn’t sewn on yet either, but I like the placement and will add lots of silk ribbon embroidery and beads to that motif and along the arch. The top arc fabric section hasn’t been added yet as I wanted to complete all the tucks. This way the folds at the top will be laying in the correct direction. It will be a lot easier to add that top section if all the folds are tacked in place. Then it will be time to zig-zag the edges and do a running stitch around the actual block size, so I know what my embroidery borders are. I thought it would be fun to post about this block as a work in progress. Instead of posting a photo of the completed project, it’ll be fun to share how it develops with everyone. 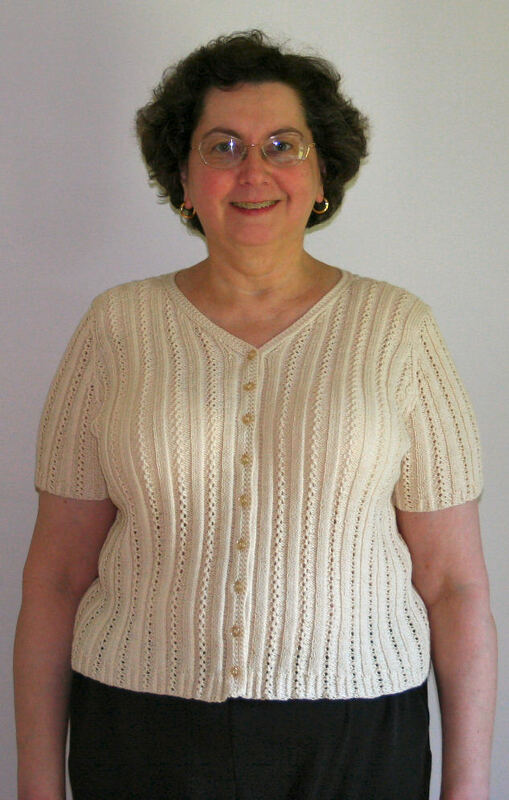 My Bella Lace cardigan is finished. It fits like a dream and I happily wore it for our family’s Father Day celebration. As you can see, I’m ample and have been for awhile now. I’ve been wearing oversized clothes because frankly, it’s hard to find comfortable, well fitted clothing for the curvy, ample sized figure. Boxy, oversize clothes are a style I’ve never liked, and I really don’t think they are all that flattering to the female form – no matter what size it is. Life is a celebration. The joy I felt wearing that sweater yesterday was obvious. My younger sister commented on my “playful” upbeat mood. I felt good and it showed. Sharon posted the colors for June’s TIF Challenge and I made a color blend chart for everyone again. 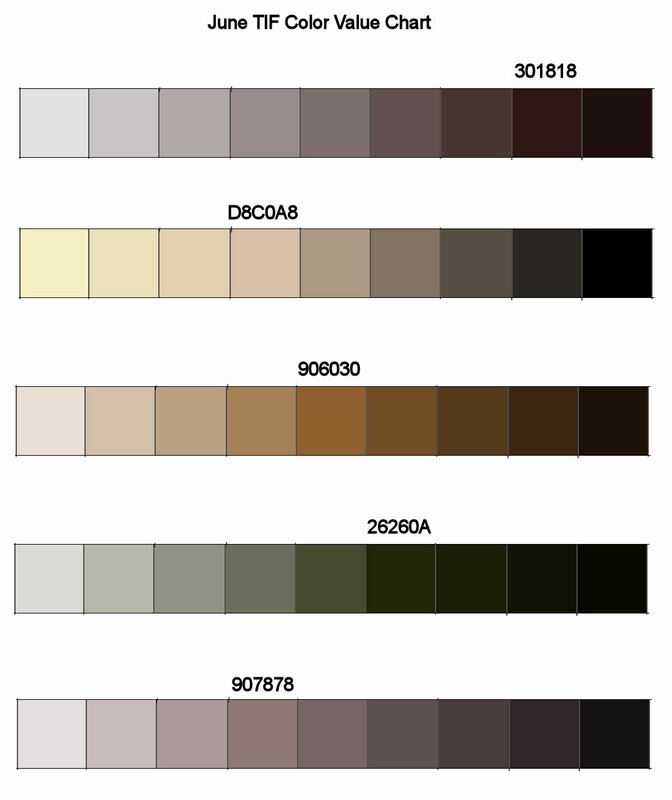 Please feel free to copy it, and I hope it is of some help in selecting your colors.